In 1883 the home was built for Harriet Kent Clapp, eldest of Zenas Kent’s 11 Children, and her son Charles. Harriet had married Charles Clapp, but when he joined the Shaker religious community, she chose to leave him behind, living alternately in Kent with her son, Charles or in Brooklyn, N.Y. with her brother, Henry Kent. Charles lived in the home with his wife, Mary Eliza Wood, and their four sons, Charles, Frank, Leon and Harold. Leon’s initials were scrolled on the plaster in the front parlor, where they remain. The Victorian house features high ceilings, large rooms trimmed with carved cherry woodwork, three sets of pocket doors and a large entryway with an elaborate staircase. It also has four unique fireplaces and sits atop the hill on East Main Street with dignity and beauty. 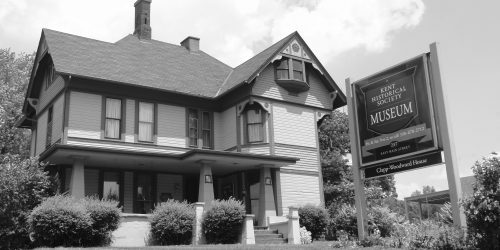 In December of 2010, the Kent Historical Society purchased the house. The society’s historical remodeling will continue to preserve the building as its home for generations. Clapp-Woodward House, built in 1883, located at 237 E. Main Street.